MY VOW TO YOU... - Petali Curated Florals and event styling studio serving 30a alys beach rosemary beach destin and seaside florida. 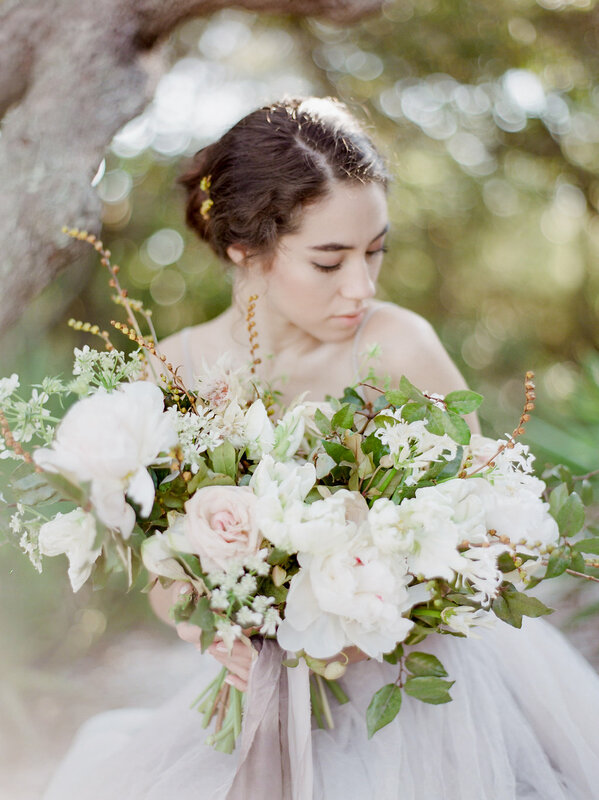 This Alys Beach wedding editorial was inspired by the “Morning of the Wedding Day” and is set along the dunes of beautiful Scenic Hwy 30A in Santa Rosa Beach, Florida. Finally, the family and friends are here and the house is buzzing with excitement of the wedding day! The stunning bride sneaks away for few short moments of serenity by the calm sea.. Deep in thought, she takes a moment to write down her hopes, wishes & vows.. Inspired by our beautiful surroundings, we opted for use of limited palette in florals as well as wardrobe. And effortless, understated hair and make up is always the timeless choice. We played with idea of texture of the veil, as it draped over bride holding her garden inspired bouquet. And custom dyed silk ribbons and tarnished silver accents added a touch of elegance. The shoot started just before the sunrise and continued into the early morning of soft light.